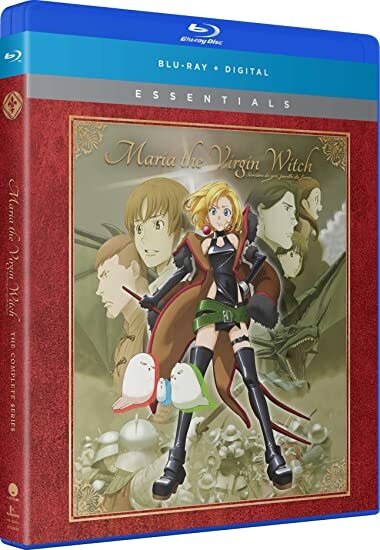 Maria the Virgin Witch: The Complete Series - BUY THIS BLU-RAY! Don't miss this intriguing tale of magic, war, and sexual politics from Production I.G., the studio that brought you Eden of the East, FLCL, and Ghost in the Shell! In the time of the Hundred Years' War, a young and powerful witch known as Maria leads a reclusive existence. Shunned by the church – but beloved by a few locals – Maria endeavors to use her magic to bring an end to the warfare she so despises. Using her magical ability, she aids humanity alongside her two familiars: a seductive succubus and an incubus…who's a little incomplete. Though she seeks only peace, the archangel Michael despises the way she uses magic to interfere with human affairs and decrees that should she ever manage to lose her virginity, her powers will vanish! To ensure that Maria no longer mixes magic with warfare, Michael sends the angel Ezekiel to keep a watchful eye on the virgin witch. In theory, his plan is sound. But keeping a fiery young woman bound by the rules of a higher power might prove too daunting even for an ever-vigilant angel. THEN SEND IN A COMMENT ABOUT YOUR FAVORITE FUNIMATION TITLE (you may click on artwork above for a refresher) PLUS YOUR NAME AND ADDRESS TO contests@efilmcritic.com or WeLoveHBS@aol.com. (Just one e-mail please.) Put [b]"I SPELL VIRGIN M-A-R-I-A" in the subject line and cross your fingers. We will draw names and one of the prizes could be yours. Only 1 entry per household.